What's for Breakfast? It's Monthly Theme Day! "Cereal is the second most popular breakfast item [in the US] after coffee...On any given day, 40 percent of all breakfasts consumed in the United States are cereal. And it has been that way almost since ready-to-eat cereal first hit store shelves in the early 1900s. "Up until then, people ate hot breakfasts of eggs, toast, waffles, pancakes. As women entered the workforce, cereal became the most popular breakfast because it was quick and convenient." I supposed if my house is any sample, cereal wins, 2 or 3 to 1, on any given weekday morning! (The only competition is from frozen waffles. ) On weekends, it's another story - we often indulge in French-style buckwheat crepes with Nutella! There are 99 (as of this writing) Daily Photoblogs participating - if you want to find out what's for breakfast in Stockholm, or Tel Aviv, Monte Carlo or Albuquerque, Bucaramanga, Zurich, or San Diego, take a tour! Remember, due to differences in time zones, there are differences in when the posts appear! Love this uncluttered photo. Speaks volumes without needing any commentary. Simple, elegant and says it all! Crepes with Nutella, hmmm! I've been known to eat those for breakfast on occasion, and not even healtly buckwheat ones. :-) Although I had a photo of eggs yesterday, we actually eat them very seldom. I like them with runny yolks! Delicioussss! Echoing the other commenters, nice simple pic. Although I bet a lot of Americans are thrown by the brown egg! I'm a big fan of a good old British Egg & Bacon breakfast (I think in the US you call bacon ham?) even better with all the trimmings; fried slice (bread), sausages, black pudding, fried tomatoes, mushrooms and anything else that will fit on the plate...LOL Tastes great but plays havoc with the waistline! don't know how long ago it was now but I remember the British Egg Marketing Board [or some such name] used to run adverts with the theme: "Go to work on an Egg"
Nothing like a really fresh egg. I've friends in the UK who keep chickens and I always bring back half a dozen when I visit. 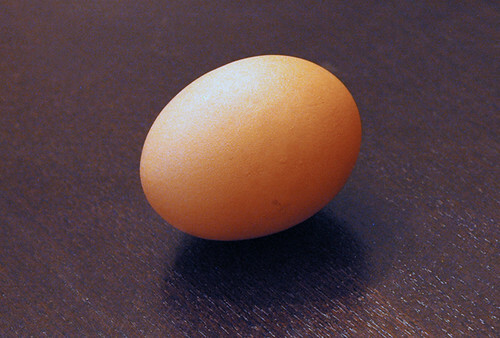 Great pic of an egg! Yep. An egg a day keeps the cholesterol healthy but I almost always eat them every day in one way or another. Not sure why but guess it is my midwestern upbringing. That and we kept chickens during the war years. "n French-style buckwheat crepes with Nutella" - I know the feeling LOL. Great photo! Simple and beautiful. Super photo for our theme day! Great commentary, too, on the typical American breakfast. We used to tease our daughter that she was made entirely out of waffles. ;^) I remember at a pediatric appointment the doctor asked her what she had eaten for breakfast. She replied, "Waffels" with great enthusiasm and told him all about the maple syrup and OJ. The doctor turned to me beaming and complimented me on what a great mom I was to ensure my child had a nutritious hot breakfast. I could tell he wasn't the cook in his family. . .he'd no idea they were toaster waffles! Great take on the theme, nice photo! hehe eggs still hold the titles for the best breakfast food. I have to go for the lower cholesterol cereal these days Jenny, although there are times I could kill for a traditional full English breakfast of bacon, eggs, sausages, tomatoes, black pudding, fried bread and beans! You forgot to mention boiled. Our in my case, egg whites ... For all the bad health press the "incredibly edible egg" has received, you are correct it is number one ... I like the industry advertisement campaign as well. I half expected to see a chicken when I clicked on the link "and this is where I get it from"
Err... what's wrong with brown eggs now?